Your idea is the brightest one in the toolbox. These work great as promotional giveaways, keeping your logo right under their finger tips. When things get stressful, nothing is more relaxing than squeezing a custom printed promotional stress reliever, or a logo stress ball. 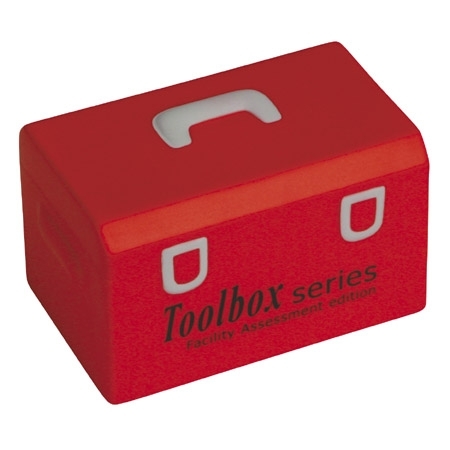 Tool Box Stress Ball made of polyurethane foam. 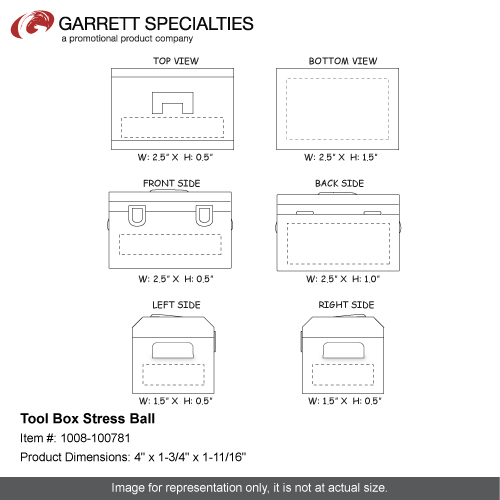 Build your client base with this toolbox shaped stress reliever!Great for any construction company, auto repair shop or for companies that think outside the "box", this 4" x 1 5/8" x 1 3/4" toolbox stress reliever looks just like the real thing. Safety tested, this product is intended for adults or for general use by consumers of all ages. Not intended for children under three years old or for pets. Relieve stress and have fun at the same time! 4" x 1-3/4" x 1-11/16"
Bulk / 27 lbs / 250 pcs. / 24" x 14" x 15"box. Imprint Area: 2.5" x 0.5"